The organizer on the Nokia Asha 306 is well stocked as usual and things have been nicely touch optimized. The Calendar starts off in month view. Day view is also available, but there's no week view. You have various kinds of events available for setting up: reminder, meeting call, birthday, anniversary and memo. The agenda, to-do and notes tabs in the calendar are self-explanatory. The alarm app uses big, touchable numbers, making it easy to set and you can make it go off only on specific days. You can customize the snooze time too, but there's only one alarm available. The other organizing features include a voice recorder with no time limit, a basic calculator and a countdown timer. They have been touch optimized as well, though we wish the countdown timer used the same big numbers as the Alarm clock. There is also a weather app and pre-installed Facebook and Twitter clients (combined within the Nokia Social app). You can browse the apps available in the Nokia Store by categories - Applications, Games, Audio and Video content, Personalization; or by collections. There are plenty of apps and games there, a lot of them free. They are still behind the big players in the app store game, but for a feature phone having an app store at all is a major bonus. Finding stuff seems to be a problem as the search function in the store is pretty spotty. Your account profile keeps track of all the apps you have installed under My stuff. Nokia Asha 306 owners have 40 EA games waiting for them in the Nokia Store - all for free. 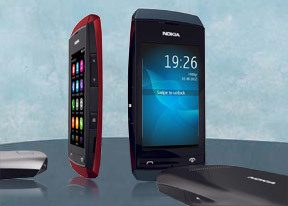 The Nokia Asha 306 doesn't have a GPS receiver but Nokia Maps can use Cell-ID to get your approximate location. The app doesn't feature voice-guided navigation anyway and you can only plan pedestrian routes with it. So, even if you hook up a Bluetooth GPS receiver to the Nokia Asha 306 it still won't function as a car SatNav. There's no option for a paid upgrade either. Maps are downloaded through your data connection, which is something else to keep in mind. Despite having a resistive screen, the Nokia Asha 306 supports pinch zooming, though maps do take a second to redraw. There are also the standard +/- zoom keys if pinching feels awkward on this screen.